As currently constituted, the Disney entertainment empire is a near perfect example of enterprise synergy, with success in one arena leading to success in others. So, it comes as no surprise that, after the spectacular box office results of various of Disney’s Marvel films, including this year’s Black Panther and Avengers: Infinity War (and the non-Disney Marvel film for Fox, Deadpool 2) that this massive public penchant for superheroes comes at a very good time for Pixar, which just happened to plop its own animated superhero effort, Incredibles 2, into theaters just as the box office for the various Marvel films was subsiding. Frankly, Incredibles 2 would probably have been a hit even if it were a cross between Howard the Duck and Mighty Mouse. Fortunately, however, Pixar put its usual care and attention to detail into this overlong but entertaining sequel. The Incredibles, the heroes of both the first film and this sequel, are a family that possess a variety of amazing powers. Mr. 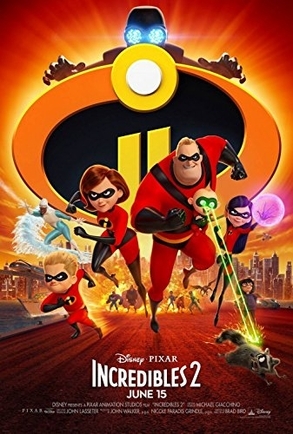 Incredible (voiced by Craig T. Nelson), has super strength; his wife Elastigirl (Holly Hunter) can stretch her body seemingly beyond all limits; teenage daughter Violet (Sarah Vowell) can become invisible; son Dash (Huck Milner) is a speedster, and nobody seems to know what baby Jack-Jack’s powers might be. Together with their pal Frozone (Samuel L. Jackson), who can whip up ice sculptures out of thin air, they fight crime and evil whenever it threatens the city of Metroville. Except, that is, when the authorities feel that the cost of having superheroes destroying vast swaths of the city while doing battle with these supervillains outweighs whatever benefits that stopping crime provides. So, after their latest encounter with the villainous Underminer (John Ratzenberger) goes awry, the Incredibles and Frozone are ordered to put away their costumes for good. The Incredibles are not put out to pasture permanently, however, since the brother and sister high tech billionaires Winston (Bob Odenkirk) and Evelyn Deaver (Catherine Keener) love superheroes in general and the Incredibles in particular. So, Winston starts a PR campaign to make the public love the Incredibles again, and he decides to put the spotlight on the most popular member of the family, Elastigirl. Winston has camera crews follow Elastigirl in action as she stops a runaway train from wreaking havoc and, by doing so, wins the adulation of the public. In the meantime, Mr. Incredible has to adjust to life as a harried house husband, helping Dash with his homework while trying to keep Jack-Jack out of trouble (see clip below). Trouble does find the Incredibles, in the shape of a new supervillain, the Screenslaver, who has the ability to put people into hypnotic trances and was responsible for the near trainwreck. The Screenslaver has a grudge against superheroes and the public that worships them and is determined to bring them down to size, in part by hypnotizing the heroes and using them as weapons against the citizenry. Mr. Incredible, Elastigirl, and Frozone all fall under the Screenslaver’s spell, as do various other superheroes that Winston and Evelyn have brought back to Metroville to honor. But, while Incredibles 2 does a great job of making its characters more relatable than almost all the live action superheroes on display this year, the movie doesn’t neglect the fun element is well. There’s a lot of humor, including a battle between Jack-Jack and a scavenging raccoon that recalls the best of the old school Warner Brothers cartoon animal combats. The real combat scenes in Incredibles 2 aren’t neglected either. The detail in the animation and production design are amazing at times, and, freed of the need to maintain even a semblance of real world credibility since the characters clearly aren’t living in the real world, the action scenes can be even more spectacular than what has been on display the last few months. That spectacle turns into the film’s major drawback, one that becomes considerably more apparent in the last half hour. The drawback: there is no danger involved because these are cartoon characters. Just as no one ever feared for Bugs Bunny’s safety, adult audiences don’t get involved here, and these action scenes fall into the same trap that haunts the Marvel films, namely, there is simply too much cinematic overkill. The finale in particular, which was designed to give each hero an opportunity to shine separately at one time or another, seems to run out of gas a good ten minutes or so before it actually ends. Add to that a villain in the Screenslaver who proves to be somewhat underwhelming and the result is a superhero movie in which the super heroics are actually the weak link. A 90-minute Incredibles 2 might have been another Pixar classic, but at two hours, it will probably try the patience of both older and younger viewers. But what it does offer before the feeling of ennui sets in is among Pixar’s best, a look at a family that, despite having all sorts of superpowers, has the same problems the rest of us do, and, in facing those problems the same way normal mortals do, they actually become quite approachable. Surprisingly, I felt more of a humanity in these animated characters than I did in the entirety of the Avengers and Deadpool movies combined, and that is truly an incredible feat. In this clip, Baby Jack Jack shows off his new powers to Craig T. Nelson and Samuel L. Jackson.